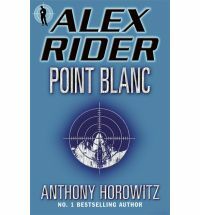 Alex Rider is back and trying to fit back into school. He’s trying to juggle a double life and finding it difficult to adapt. he’s not left alone for long though as MI6 have plans for their teenage spy. This time it is Alex’s job to infiltrate the uber exclusive Point Blanc Academy. They accept only a very small number of students, troubled boys with very influential parents. But something has happened that has aroused MI6’s suspicions and they need Alex’s help. Equipped with a few new gadgets and his quick mind Alex has to get accepted in and find out what is really going on. In between getting drugged and the elaborate mind games they seem to be playing on him Alex finds himself stuck in the mountains with enemies closing in. His only way out is so risky he may not survive. A fitting sequel to Stormbreaker. Alex’s annoyance and reluctance are creeping through and for me this makes him a more appealing character than if he did it and loved it. There is plenty of action, some fun toys that you’ll wish you could have and plenty of the suspense you want in a spy novel. A good read for someone who likes their spy stories but has out grown Zac Power.